Blogs | Something should go here, maybe later. If I did this again, would anyone contribute? 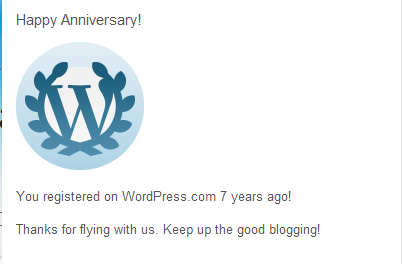 Seems it’s been 7 years since I started this blog. Readers may have noticed the blog was locked for a while tonight. This seems to be the best way to update old posts with proper tags without spaming the RSS feed with old material. It was interesting to read many of my old posts. I seem(ed) to have a habit of not really explaining my thoughts fully. There was also a problem early on with WordPress.com where posts would get cut off randomly, but I think that mostly it was me not fully expressing my thoughts, and assuming that future readers would know the full context of my (now cryptic) comments. Speaking of the tidy-up, few days ago I discovered that wordpress.com has a nice tool to convert tags and categories. This has enabled me to move a number of topics to tags where they properly should always have been. The result has been that my tag cloud at the bottom of the screen is a lot more balanced. I should probably try to get rid of the smallest categories – there’s rather a lot of ’em. While doing this work, I’ve been listening the the videos on this post about fracking. Very interesting stuff. Update: Heh, blue headers. Nice. Those who follow this blog via RSS will have noticed that I’ve republished a number of my oldest posts. This is an unintended consequence of a little project I’ve had in mind for some time, and have put off until now of going through all my posts and properly tagging them. Currently, the tags only show what I’ve tagged, as opposed to what I’ve written. So Sarah Palin is quite big because I made a tag for her as soon as she came along. But any number of things that I have written extensively on over the years don’t show up because I never tagged them – in most cases because there didn’t seem much point taking the latest 3 posts and leaving the previous 300 out. Well, as readers may have noticed, things have been quiet around here for a while. As part of that, I seem to have neglected to keep my widgets up-to-date and this has given some visitors the impression that this blog is obsessed with certain things which it really isn’t. It also seems that by keeping quiet for so long, I’ve become something of a “mystery” blog and forgotten by a few customers. So I’ve gone through the sidebar and tidied it up a bit, and may to a bit of tweaking over the next few days. For now, I present this video. Like Patterico said last year, I finally “get” twitter. See here. As I noted previously “ScrubOne” is taken, so as per my YouTube account, I am “@ScrubOneHD“. Hmph. I already have one (spam) follower. That’s just wrong. I need a corporal. You’re it, until you’re dead or I find someone better. SpamAkismet has protected your site from 106,698 spam comments. Searches for the last 30 days. Well, I’ve decided to shut up shop – for a while anyway. I need to focus on other things, and to do that I need to stop spending so much time here. Included a lot of new blogs this month, and it looks like there’s a lot more out there. We’ve now got 696 blogs in the list here, with over 876 in the list (i.e. including ones that are now defunct and/or gone since they were added). The “Art” category is in desperate need of splitting, another thing to add to the “to do” list… see the notes below. To be included, blogs must contain posts on topics of interest to the general public. For a more detailed criteria list, see July. HD Score calculated Alexa*AlexaNZ/Authority/10000. Greens multiplied by 7, Labour by 3 as their blogs are only part of the site traffic, and they fall in the top 20. All data was downloaded this afternoon/evening. Any blogs that activate all 3 “if none” criteria are placed in the “can’t calculate” list, as well as most blogs that resolve to a larger website in Alexa. If blogs are defunct and fail to meet any criteria, they are not listed. 2. Feel free to suggest a new category by sending us a list of blogs that you think qualify and suggestions for icons. 4. Tumeke seems to have given up. Having some appreciation of what Tim’s trying to do over there, I can understand perfectly why that might be. If there isn’t a new ranking next month, I am thinking about instead using the Open Parachute ranking as a second reference… but I’m thinking about a lot of things. 5. Another of those things is the possibility of using the Alexa “Sites Linking In” score to balance some of the missing Technorati data. Note: Original Blog list, and original concept from Tumeke. For those who are interested, I am still happy to add people to the NZ Political Bloggers Political Spectrum Chart. I’ve also added in many of the missing links, after being interrupted half way through the job months back. Please note! The quiz is this one. In hindsight, this one is more popular and we should have used it instead as people stumble on it themselves. Oh, and can someone please come forward with a higher authoritarian score than mine!! !